. : Farm Forest Line - How to prune for clearwood production :. Producing a clearwood log requires careful management over several years to ensure an even knotty core and thick clearwood sheath. The most effective way to achieve an even knotty core is to prune regularlyevery year for most speciesto a predetermined stem diameter. For example, annual pruning to a stem diameter of 810 centimetres will ensure that sufficient green crown remains for growth. This should ensure that the knots are contained within a core of no greater than 20 centimetres. In some regions and species detailed pruning prescriptions based on years of research data are available. However, in general farmers are growing different species in different ways. Over time they may be able to refine their techniques. Until experience or research demonstrates otherwise a useful guide is to annually prune any branch with a stem diameter greater than 2.5 centimetres, anywhere up to the anticipated log length and then lop all remaining branches below the point where the main trunk is 810 centimetres in diameter. This means pruning will be done over three or four years, beginning when the trees are about five metres tall. Removing large branches early reduces the workload in later years as well as the likelihood of disease entering through the stubs. Any trees that are clearly malformed due to a twisted stem, kinks or large branches are usually culled.  Prune stands of lower stocking density. Because there is less competition for site resources trees will maintain higher diameter growth rates than in dense stands.  Choose the more vigorous, straight trees with small branches because they are easier to prune.  Minimise the number of pruned trees that will need to be culled at a later time. The time taken to prune individual well-formed eucalypts is conservatively estimated to be around two minutes for the first lift, three minutes for the second and four minutes for the final lift to 6.5metres. Skilled operators, using a ladder and harness, can high prune at least 20 well-formed eucalypt trees per hour in good conditions. Based on these estimates pruning to 6.5 metres might take about 10 minutes per tree. Depending on labour costs this shouldnt amount to more than $10.00. In New Zealand, experienced contractors are expected to be able to prune 1025 pine trees per hour, whether working from the ground or from ladders, at a cost of between $4.00 and $7.00. Pruning costs are higher for heavily branched species or when pruning is done late. Steep sites or those infested with weeds will be more expensive again. Flat grazed plantations on cleared farmland are often the easiest and cheapest to prune. Because pruning costs are directly proportional to the number of trees, there is a great deal of pressure on final stocking rates. There are no simple answers as to the right final crop stocking to aim for. A major consideration will be the degree to which competition between the trees slows diameter increment. For the more tolerant softwoodsfor example, Pinus spp and Araucariafinal stockings of between 200 and 300 stems per hectare are reasonable. For hardwoods like eucalypts and rainforest species a maximum final crop stockings of between 100 and 150 stems per hectare might be justifiable. 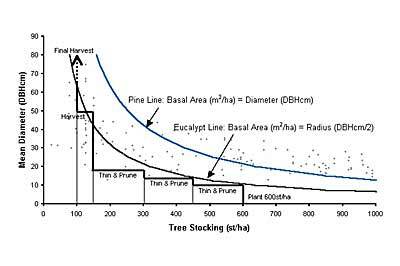 The following graph presents a simple model for estimating near free growth stocking levels for crown-shy eucalypts and the more tolerant pines. The model uses basal area as an indication of the level of competition between trees. If trees contain no heartwood then the basal area is proportional to the size of the canopy. However, as trees grow, an increasing proportion of their basal area is comprised of heartwoodwhich has no physiological function in the tree. As a result, the basal area corresponding to a particular level of competition in a plantation will actually increase over time. The model used in the graph accounts for this by relating the critical basal area to the size of the trees. By measuring their trees regularly farmers should be able to refine the thinning model so that it better matches their site and the species they are growing. If pruned trees are grown free of intense competition, the width of the growth rings, and hence the eventual yield of clearwood, will be greater. If the forest is not thinned diameter growth will eventually suffer due to the increased competition (as indicated by the area above the curve in the graph). However, if competition is reduced too much, the volume production per hectare will be very low and exposure may affect tree form. Although trees grow faster on better quality sites, the point at which competition reduces diameter increment doesnt vary as much as might be expected. Concerns about low stocking densities inducing heavy branching in the stem above the pruned section, need to be balanced against the higher, upfront cost of pruning more trees and the longer rotation associated with higher final stocking. On high quality sites where trees are likely to grow very tall (say more than 30 metres) growers may be advised to try and prune higher (up to 8 or 10metres) because a high proportion of the total tree volume will be above 6.5 metres. Free growth lines for eucalypt and pine based on a simple basal area model showing a possible regime for eucalypt sawlog production. Diameter growth is compromised if plantations are growing above the line. Dots show actual plantations of eucalypts in Australia and New Zealand up to 40 years of age.